Geoffrey Boycott divides opinion perhaps like no other cricketer past or present. The Reverse Sweep falls into the former camp and mostly forgives him for his many transgressions such as shirking out of the 1974/75 Ashes series, going on the rebel tour of 1982 and for generally being a selfish so and so. We like people to have opinions in a world that is becoming increasingly banal and obsessed with celebrity and political correctness. Boycott certainly has plenty to say and isn't afraid to share his views with anyone that will listen. But his remarks about Michael Yardy's premature return from the World Cup due to a depression related illness were beyond the pale. He was clearly talking about a subject on which he knew nothing about and even if his words were probably taken out of context by a media desperate for a bit of controversy, Boycott should have probably kept his mouth shut on this occasion. So it is refreshing that with the sad news this week that Yardy has had to take more time off to treat his illness, Boycott has issued (albeit rather belatedly) a fairly contrite apology to Yardy via the BBC website. Boycott is not known for admitting his mistakes, so it is doubly pleasing that on this occasion he has decided to climb down and genuinely (in our view) accept that he got it horribly wrong. It goes without saying (and not just because we are Sussex supporters) that we wish Yardy a speedy recovery and hope to see him back in action soon. Bangladesh's shock win at Bristol may have made the series surprisingly interesting, but England's clinical performance in the decider at Edgbaston showed the true gap between the sides was as big as the one between Craig Kieswetter's bat and front pad. So that's four one day series wins on the trot now for England since they surprised South Africa in their own backyard last November. How did each if the troops rate in this three match campaign ahead of the World Cup assault next February? And who can start packing their kit bag now? Ravi Bopara - 8 (1 match: 45 not out from 16 balls, 4/38) - At last Bopara was given another opportunity in his best ODI position - number six. 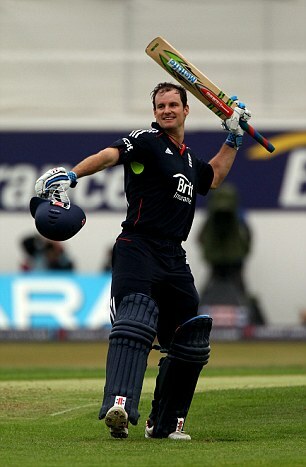 Could prove to be England's answer to Michael Hussey with his ability to embellish, finish or resurrect an innings. His underrated bowling is a useful weapon too. Bopara or Luke Wright? Not a difficult choice, is it? Reverse Sweep WC rating - Should be on the plane, but how tied are the England hierarchy to Wright? Michael Yardy - 6 (28 runs, Avg 28, SR 57.14, HS 10 not out. 2 wickets, Avg 40.50, Econ 4.26, BB 1/15) - Has a consistently good economy rate, which is lucky considering his paucity of wickets. Works well in tandem with Swann, but Adil Rashid would be a far more attacking option if perhaps loaded with risk. Reverse Sweep WC rating - In the departure lounge as one of three spinners in the squad, but will he be usurped by Rashid for a place in the XI? In the end dreams of a 5-0 whitewash ended up as a narrow 3-2 victory with many wondering that if Shaun Tait had played from match one, whether the score would have been very different. England certainly controlled the series for the first two matches and ninety overs of the third, and although the batting collapse at Old Trafford did not lead to a disastrous defeat, the pendulum of momentum shifted to Australia thereafter. At The Oval it was nineties from Ricky Ponting and Michael Clarke, and at Lord's it was a typical back to the wall innings by Michael Hussey that ultimately meant England had too much to chase in the last two matches. On both occasions Tait, Doug Bollinger and Ryan Harris made early inroads and unlike at the Rose Bowl in the first match, no-one could emulate Eoin Morgan's masterfully timed hundred to see England home. So who apart from Morgan shone for England? And who were the dunces that need to stay back for lines and extra tuition? Andrew Strauss - 8 (191 runs, avg 38.20, SR 78.27, 2 50s, HS 87) Silenced the few doubters before the start of the series by outscoring Kieswetter and getting his runs quicker to boot. Needs to start converting 50s into 100s though. Craig Kieswetter - 4 (69 runs, avg 13.80, SR 70.40, HS 38) There was bound to be a stutter after such a stellar start to his international career and this was it. Scored 38 in the first game, but really came down to earth with a bump after that. At least Matt Prior is sleeping more easily now. Kevin Pietersen - 4 (95 runs, avg 19.00, SR 79.16, HS 33) A top score of 33 is not what we have become accustomed to. Still seems to be suffering a hangover from the World T20. Maybe it is all those sleepless nights and nappy changes? Paul Collingwood - 8 (209 runs, avg 41.80, SR 72.31, 1 50, HS 95) England's all-time record one day runscorer was his usual dependable self and this famous chaser of lost causes nearly rescued his side at Lord's with a brilliant counterattacking 95. Eoin Morgan - 9 (238 runs, avg 59.50, SR 92.24, 1 100, 1 50, HS 103*) Can now add consistent to his growing number of attributes. His hundred at the Rose Bowl was one of England's best one day innings for years. A very special batsman. Michael Yardy - 7 (66 runs, avg 22.00, SR 86.84, 1 50, HS 57. 2 wickets, avg 92.50, Econ 4.40) Continued to impress with his darts even if wickets were a rarity. Had the best economy rate of any England bowler and scored a good 57 in a losing cause at The Oval. May have booked his spot for the World Cup. Luke Wright - 6 (69 runs, avg 13.80, SR 62.16 HS 36. 3 wickets, avg 44.00, Econ 5.07, BB 2/34) His partnership with Morgan at the Rose Bowl helped turn the game England's way but his batting fell away thereafter. The same was true of his bowling after he snared Paine and Ponting in the same match. Can England really accommodate Wright and Bresnan? Tim Bresnan - 5 (1 wicket, avg 236.00, Econ 5.61, BB 1/52. 109 runs, avg 36.33, SR 91.59, HS 34) Is in the team as a bowler who can bat, so will be disappointed to have taken only one wicket in the five matches. His batting is much more impressive as evidenced by the cool head he showed at Old Trafford to sneak England over the line and his partnership with Collingwood at Lord's. Needs to work on his main role though to keep his place in the side. Graeme Swann - 8 (8 wickets, avg 20.37, Econ 4.52, BB 4/37) Eight wickets at a decent average and economy rate meant that Swann's success story in international cricket continued. Bowled wonderfully at Old Trafford and his death or glory batting at Lord's was typical of the man. Stuart Broad - 8 (12 wickets, avg 19.83, Econ 5.40, BB 4/44) If that's what strength conditioning does for you, then Flower should send the whole team on a course. England's leading wicket taker bowled well throughout the series but saved his best for Cardiff where some quality fast bowling accounted for Ponting and Clarke. But what has happened to his batting? James Anderson - 6 (7 wickets, avg 38.42, Econ 5.72, BB 3/22) It was the usual inconsistent fare with the brilliant (3/22 at Old Trafford) mixed with some absolute tosh. Was lucky to play all five games ahead of Sidebottom. Do Australia's batsmen have his number?